An innovative new cork which screws into its wine bottle has been dubbed “the most sensible reformulation of packaging ever” by the companies behind it. The resealable Helix cork has slashes down its sides which allow it to screw into a glass wine bottle with a similar thread on the inside. 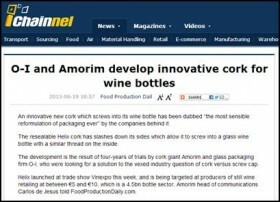 The development is the result of four-years of trials by cork giant Amorim and glass packaging firm O-I, who were looking for a solution to the vexed industry question of cork versus screw cap. Helix launched at trade show Vinexpo this week, and is being targeted at producers of still wine retailing at between €5 and €10, which is a 4.5bn bottle sector, Amorim head of communications Carlos de Jesus told FoodProductionDaily.com. He explained that industry statistics suggest that around 70% of wines are sold in bottles with natural corks, around 10% with synthetic corks, a declining sector, and around 20% in screw cap bottles. The Helix was initially being launched in France, Italy, Portugal, and Spain, where corks were very prevalent. Helix can be quickly and easily implemented by wineries with only a minor adjustment to the existing filling lines and involved minimal cost premium, de Jesus said. In testing conducted by Amorim and O-I, wine packaged in Helix glass bottles with cork stoppers showed no alteration in terms of taste, aroma or colour. As part of the development process, market research in France, UK, USA and China revealed great consumer acceptance of Helix for fast turnaround and popular premium wines, the companies report. In addition, consumers also appreciated retaining the festive ‘pop’ associated with opening a bottle of wine, they said. The Helix concept combines all the benefits of cork and glass – quality, sustainability and premium image with user-friendly, re-sealable convenience, he added.